it is a revolutionary design that provides more than just architectural lighting. For safety, security, outdoor storage, car lots, and recreational sports activities, the Alpha Flood is the energy and maintenance efficient LED powered flood light to specify. 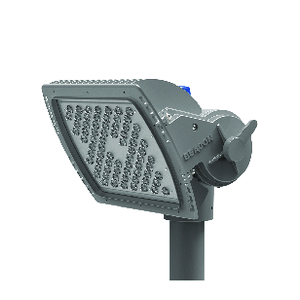 Whether pole mounted, wall mounted or base plate mounted, the Alpha eliminates spill light and light trespass making it an ideal instrument for lighting commercial facilities in residential and urban settings. Additionally, the Alpha can be specified for aiming either below horizontal or above horizontal. The 6 standard NEMA beamspread options allow you to place light where you want it. Alpha IS precise. Alpha IS versatile.